Knowing how to approach a bathroom renovation can be tricky, especially if you are dealing with limited space. Re-decorating your bathroom doesn’t have to be complicated. Once you know how to use the space you have to its fullest, your bathroom renovation will soon turn from a terrible nightmare to a beautiful dream. 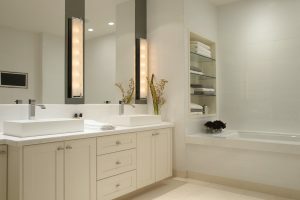 What to Consider When Renovating your Bathroom? The scale of your bathroom renovation project will ultimately depend on the amount of budget that you will have available. Remodelling your bathroom will need a certain amount of construction work and various fixtures to be replaced. If you are looking to do a major overhaul of your bathroom, include estimates for any plumbing or electrical work that may need to be carried out. Yet, if you are just looking to spruce up the visual aspects of your bathroom, this might not need as much construction during the renovation. Deciding exactly what you want to achieve from your bathroom renovation ahead of time can save a lot of hassle down the line. Who is this bathroom redesign for? Is this renovation project going to be for a family? Will it be a guest bathroom? Or is it just for yourself and your significant other? Knowing who will be using the bathroom can help determine exactly how much storage space you will need and the type of furniture that you will use. A top interior design tip is to section your bathroom up into dedicated areas. Doing so allows you to get a better understanding of any areas of your bathroom that need improvement. For example, you may have a toilet area, a shower area and a vanity area. 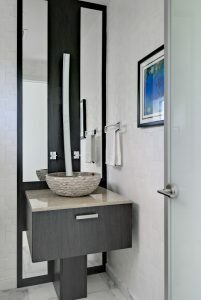 The modern bathroom style is often imagined with crisp lines and a neutral colour palette throughout. Try keeping the colour to a minimum throughout. This will give the room a very contemporary and luxurious feel. The addition of wooden flooring or furniture adds more depth to the room. Do you have limited available space in your bathroom? Not really a bath person? 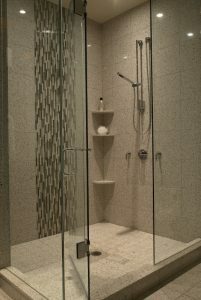 A walk-in shower can be a great way to maximize on available space and give your bathroom a much needed update. Think stone effect tiles and a waterfall shower head. The great thing about walk-in showers is that no matter what design style you preferred, you’ll find one to suit your needs. If you have a large family or simply would like a lot of storage space in your bathroom, consider adding extra shelving or investing in a large under-the-sink cabinet. 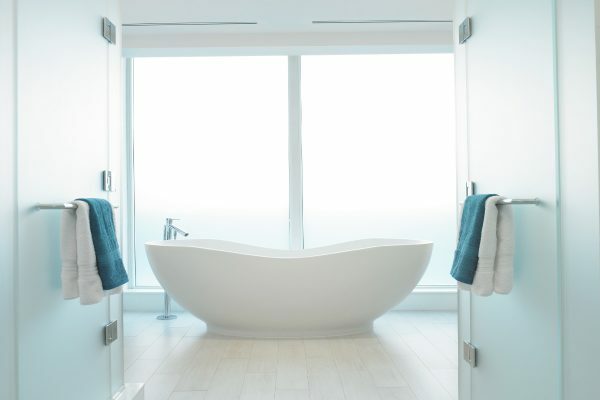 Regardless of whether it is a bathroom renovation for a condo or a vacation home, don’t underestimate the power that storage solutions can provide. Use limited space in your bathroom to your advantage. When it comes to remodelling your bathroom, consider including a small sink and vanity area which can double up as a storage solution. Floating cabinets and wall hung toilets both save on space and won’t leave your bathroom feeling too cluttered. A great way to spruce up your bathroom during a renovation is to make your bathtub the main attraction. 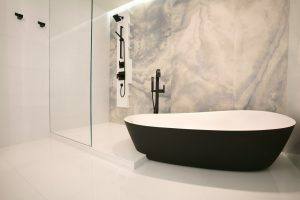 Adding a standalone bathtub can instantly update both the aesthetic value and the overall energy of a bathroom. Are you planning a bathroom renovation soon? There are many interior design and bathroom renovation ideas that you can incorporate to ensure that you achieve the bathroom of your dreams. Our experienced designers are ready to help answer any bathroom renovation questions that you may have. Contact us today.